Interestingly, I soon began to hear the mating sounds from various birds. the Cardinal and Tufted Titmouse’s chirps were distinctive. Soon I heard Canada geese and a pair flew over me honking away. nature’s mating season is in full force. Later this day I would need to be ready to play at two nearby rest homes, but I managed to get several hours of hiking. Deer tracks were numerous as I moved along. Fortunately, I spotted a deer bedded down among the fallen trees. I quickly located three more. I clicked some phots and moved on without spooking any of the three deer. Birdlife was plentiful this morning. Cardinals, Juncos, White-throated Sparrows were common. I succeeded with getting some decent pics. My friend, Frank “Muskie” Maus did out annual mid-winter hike time today. 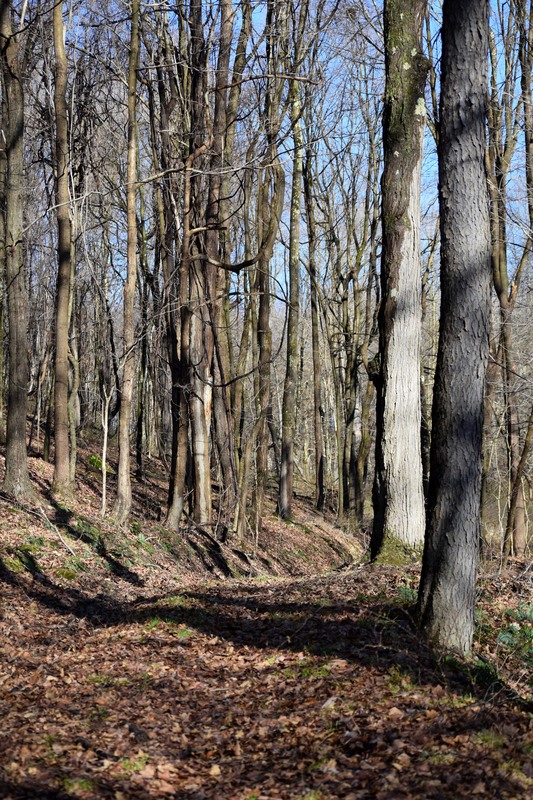 Frank wanted to explore some new woodland areas bordering a Pennsylvania Game Lands. 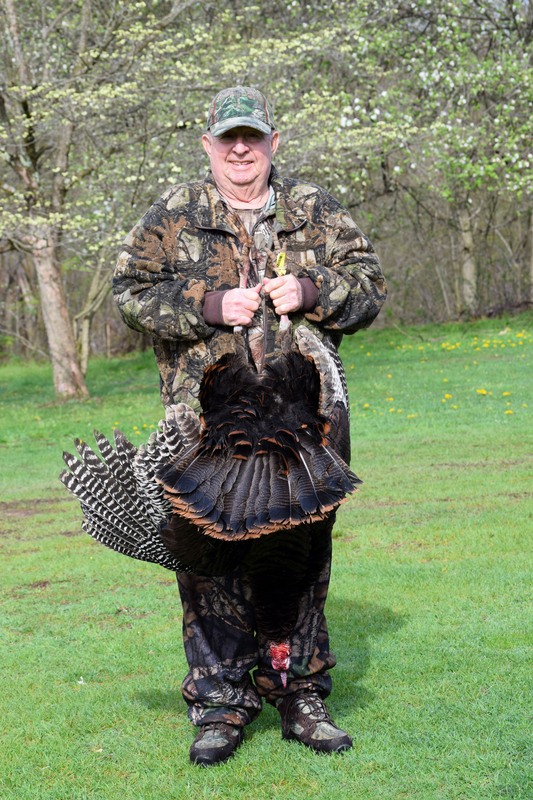 He has a nephew who purchased some acreage with a home so the potential of hunting the area needed some exploration. I have been on these particular game lands, at least, three or four times, but not on the acreage mentioned above. The area is typical with some old, long-abandoned, highwall mining sites, Autumn Olive and multiflora thickets. While traveling through these wooded areas we saw plenty of deer tracks. 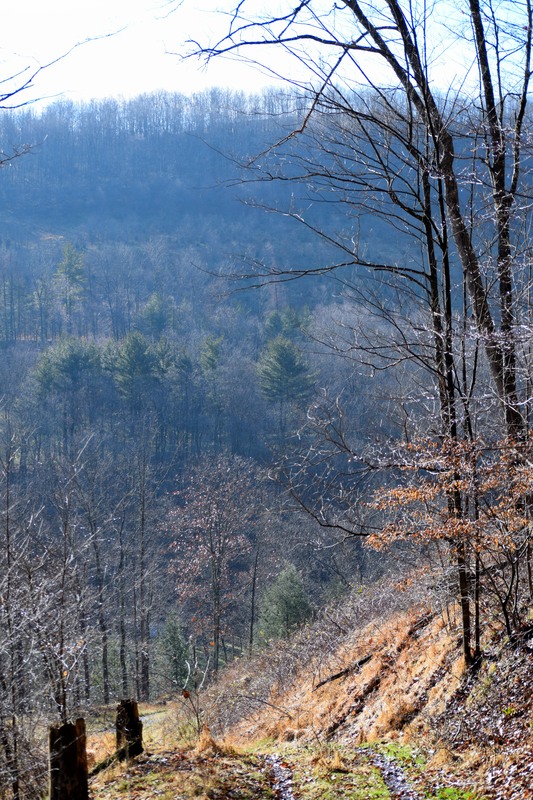 We circled the hill’s edge and returned to the road before traveling to another site familiar to Frankie as a hunter. AT this site we traveled along some high and steep river hills. We could see the mighty Allegheny River at times. We didn’t make to this slope! 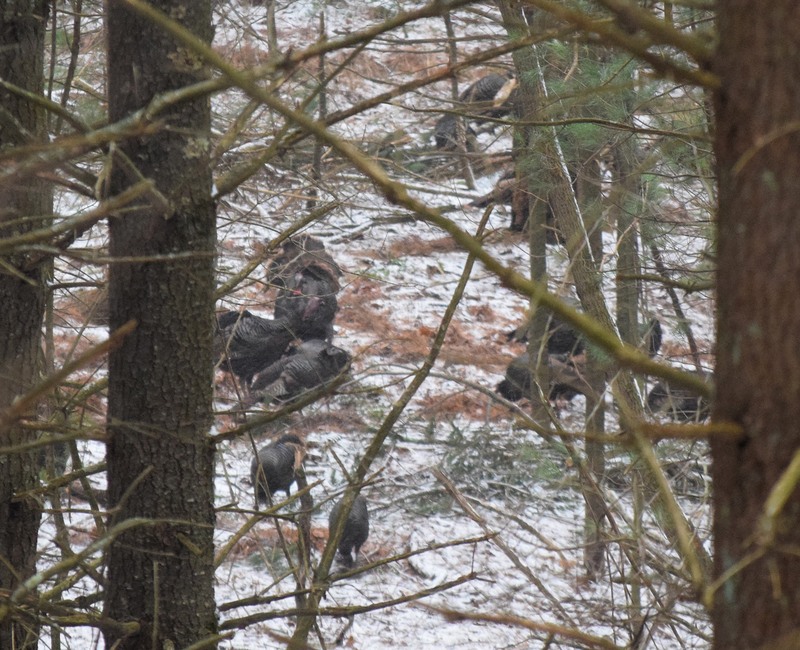 During this venture we saw around 10-12 Wild Turkeys. I arrived home after 1:00 so our time afield covered over four hours. Snow was still present in most of the areas we hiked. We, both, enjoy having some snow to help us see and observe tracks. Talks of another venture were made and we discussed future fishing adventures. This stone is behind the new addition. Last weekend was a cold and breezy day. However, Laurie and I walked some along the Redbank Valley trail bordering Redbank Creek. I wanted to check on a Bald Eagle nest, as well. We crossed out of Armstrong County, Pennsylvania at the small community of Climax. The one lane bridge over the creek is a rather new bridge. I remember some time back when this bridge was a metal bridge. Once we crossed the bridge to park for a trail hike we were in Clarion County. Anthony Loup on Redbank is an amazing waterways for the waters goes way out, maybe a mile or so before turning back sharply making for an area possibly separated with only a couple of hundred yards of land mass at one point. The tunnel has recently been renovated and improved by the Redbank Valley Trails organization. Water leaking through the stones along with freeze/thaw cycles had an effect on the ceiling areas. the tunnel had been closed for quite some time for hikers for fear of injury. the tunnel is 520 feet in length. The tunnel was built between 1878 and 1877. The eagle nest didn’t appear to be complete. High winds over the last few months must have blown much of the bulk down. However, after going through the tunnel and looking high in a White Pine I could see a huge nest. 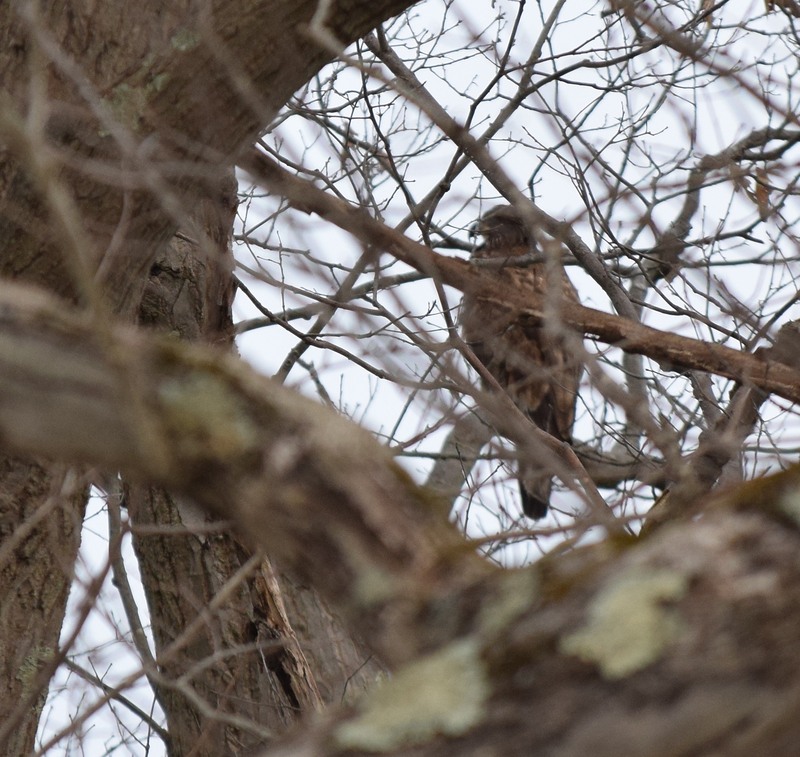 This nest was across Redbank Creek and about halfway up the slope. Could this be the new nest of the Bald eagles? 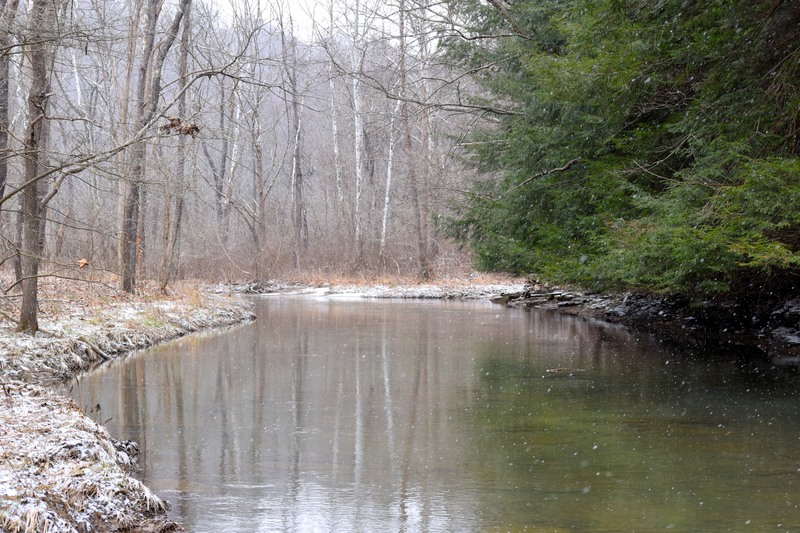 We walked along the trail for a time seeing five Mergansers on the creek. Once the morning gloom dissipated I elected to get out in the snowy day and enjoy some woodland time. Snow fell all day, but never very hard. Also, any snow falling would remain on the light side. Rural roads, however, had some slick areas in spots. 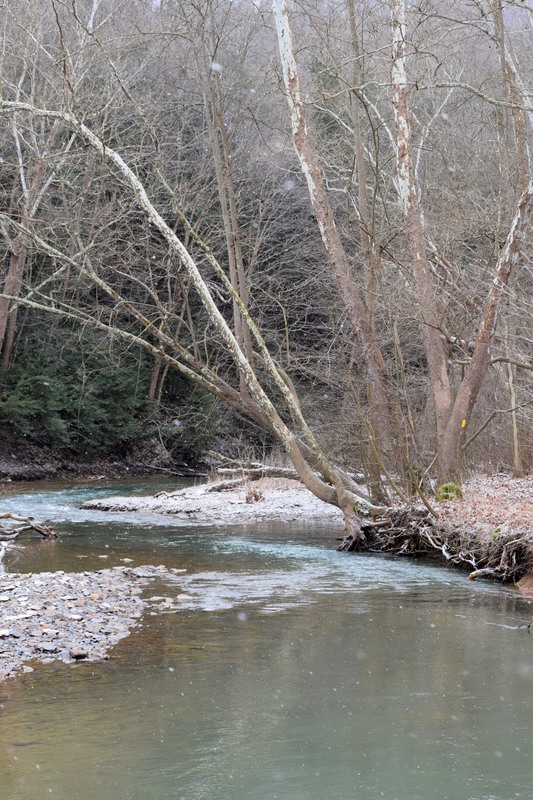 I arrived at my destination near Cochran’s Mill to walk along the old Baker trail near the lower end of Cherry Run. I didn’t walk the trail exclusively due to drainage issues of water and mud. Also, plenty of big trees were down across the trail throughout. That was just fine since the area along the creek is much more attractive to gaze upon. While walking I became a little down with my thoughts. I began thinking about the many areas I used to tramp upon and hunt that are now posted and/or developed. That made me sad. 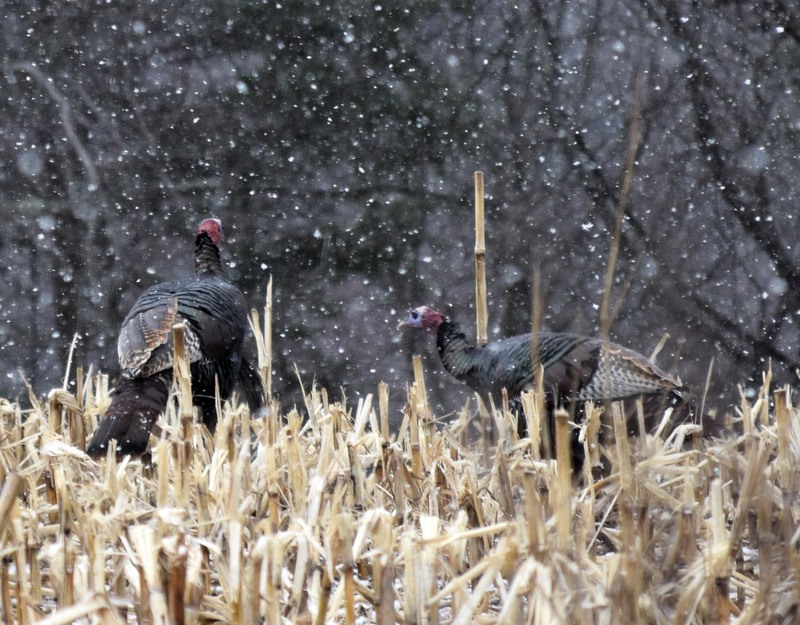 I find I am become increasingly discouraged with hunting due to such issues. Nature seems to often find away to help clear such thoughts. 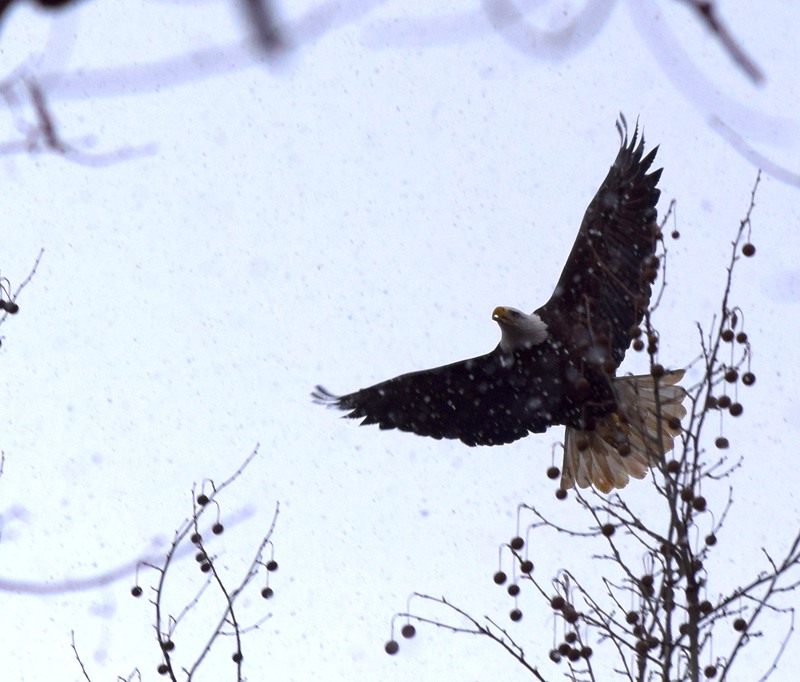 Instinctively, I guess, I looked up to see a mature Bald Eagle coming up the hollow at treetop level. The beautiful bird turned and circled again and flew over allowing for one quick photo in an opening. The eagle seemed to telling me to not be down as the wings carried it up the hollow. I would see three deer feeding along a field’s edge. 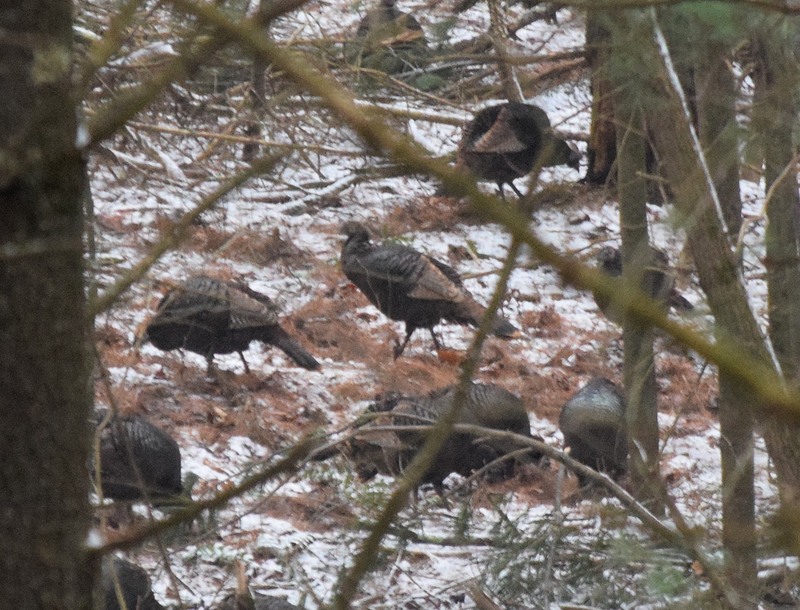 Also, I saw a darkened mass in a cut corn field only to see a flock of Wild Turkeys. I managed a half a dozen pics. Later while moving along Cherry Run I noticed a brown ball of energy going upstream. The brown mass was a mink. I took two quick photos, but they were both hazy. The mink eventually went among a root system. I always enjoy seeing a mink in the wild. It is rare. I did get a good photo of a Mink several years or so about half a mile upstream. The Constitution of the United States has been facing actions to dismantle the truth of the words for many years. I often refer to these actions as a “chipping away” process, bit by bit. This process happens due to politicians eager to force their ideologues and agenda upon all Americans. Another example is the Freedom of Speech. This Right is well on its way out because of the politically correct society America has become. The Freedom of Religion has drifted far from its original intent, as well. However, this writing is dealing with the Second Amendment and the truth about the Founder’s concept. There are people of America today actively and vocally demanding the repeal of this precious Right guaranteed through the writings of our Bill of Rights. Many others are pushing for more restrictive laws to slowly erode the Right, but these people are destroying the value with a subtler attack. These individuals are trying to hide their true plans to ensure votes. We are engulfed within some very sad times. Socialist ideals and subtle communism plans are becoming even more popular with a populace lost from knowledge of our history and the world history. The leftists have grown in numbers and have become much emboldened over the years. The last twelve years, or so, this momentum has spread far and wide across this great nation. The educational system has been infiltrated by the same groups listed above. This has been happening for many years. Each teaching year has more pronounced indoctrination being the result. Like I said…little by little with a chipping away technique. Another reality are those calling themselves Americans, yet their agendas are to promote the mind-set of a Constitution being obsolete on old faded paper. WHY WAS THE SECOND AMENDMENT SUCH A BIG DEAL? During the years prior to the independence of the thirteen colonies, in other words, the years before the forming of the United States of America, the colonists had witnessed forms of tyranny. This tyranny was being delivered from the European-styles of governing in England. The king in position was King George III. The people living in the New World had first hand knowledge of the ways of Europe. Most colonists of these times remembered England or had heard stories from parents and/or grandparents as to why this land had become occupied. Religious persecution was a primary reason to leave the motherlands. So most people born in the colonies were not very far-removed from the times mentioned above. The mid 1750 era had brought about what was known here as the French and Indian war. This war was fought between England and France with the colonists on the side of Britain. England won the war but had acquired a huge debt. The king and Parliament began placing tariffs and taxes upon the colonists to pay for the war. Some taxes and acts became known as the Sugar tax, Townshend Act, Stamp Act and the Tea tax. A cry of the day was No Taxation Without Representation. This became reality for the colonists were not included in the representation in the English Parliament. The heat was simmering! England was wanting more from the colonies. In a sense the Brits believed the colonies owed the homeland a stronger allegiance because of the French and Indian War results. The taxations and the thoughts of tyranny intensified. Physical encounters grew and shots would be fired. The conflict known as the Boston massacre was one result. England began with attempts to disarm the colonists. Such actions were viewed by many as the prelude to war with England. The Declaration of Independence was signed in 1776. That war would be reality! That war was the Revolutionary War. Once the war was victorious over England new problems erupted. The colonies now needed their own working government. This new government led by a group known as the Founding fathers created a Constitution and Bill of Rights. This once ratified would become the guideline, or the contract, as to how this new United States of America was to be governed. The Founders understanding tyranny in government wished to avoid such a government in the future. Part of that control over tyranny in government was the SECOND AMENDMENT. The Founders understood tyranny in government easily creeps into reality. They wished to avoid tyranny for the future. These words can not be any plainer to understand! Today, the left-leaning media, Hollywood elitists and progressive, liberal politicians look upon the Second Amendment as a curse. They wish this “Freedom Right” could be greatly curtailed or eliminated completely. We are in a dangerous time in America. The above-mentioned people view the “Militia” as a bunch of red-necked kooks, dressed in camo stockpiling firearms and ammunition in preparation of taking over the government through a force. The “MILITIA” at the time of the Bill of Rights and founding of the United states consisted of all able-bodied men. These men were to be prepared to take up arms to defend their families, their communities and their state and their country whenever evil threats became reality. These groups were to be “WELL-REGULATED”. In other words, these men were to be prepared to defend. Many communities would, actually, have a leader or “captain” to oversee the training. Often times in these early years the defense may be against Indian raids. However, this preparation was, also, to be organized against any attacks concerning any foreign and domestic threats against America’s way of life. This threat included any American tyrannical government of the future. This is the “SECURITY OF A FREE STATE” thinking behind the Second Amendment. Note the Founders added “Necessary.” They wrote: “NECESSARY TO THE SECURITY OF A FREE STATE.” These men understood actions to defend their free state may be “necessary” sometime in the future. These men knew evil was real and the Second amendment was added within the Bill of Rights as a safeguard against such future evil intents. Those next words of the Second Amendment include, “THE RIGHT OF THE PEOPLE TO KEEP AND BEAR ARMS.” The people are those of America needed to defend and keep evil and tyranny out of government and families, communities and states. Is this so difficult to grasp? The Founders wrote next to the right of the people the words: “SHALL NOT BE INFRINGED.” Their words didn’t say possibly not be infringed. The word “SHALL” means exactly wat it says. You may hate the Second Amendment, you may try to twist and distort what the founders meant through their wording, but you would be incorrect and falling into the mindset of the leftist progressives. Your personal ideologue doesn’t change the reality of the Second Amendment. HOW DO WE KNOW THE FOUNDER’S ORIGINAL INTENT? The Founders, and justices of the times, and after, left behind many, many written words and rulings pertaining to the Second Amendment. Space would not allow to record many for this narrative. They are available to read to anyone not afraid to be educated to their words. Therein allows for another issue of failings. The educational system, both schools and colleges, have become so progressive in thought that words of wisdom concerning the Founding of America and the freedoms bestowed for us are not being taught or worse being distorted to fit political agendas. Today, we see an ignorance of knowledge of history. We are seeing socialism creeping into all walks of America. Again, this fact is due to the educational system failings in teaching and an acceptance blindness to truth or a stupor. Add an unwillingness to question the educators and following like sheep to slaughter and we have a recipe for disaster approaching this country. The narrative of America has been a cleverly created utopia potential with a pre-World War 2 mindset similar to Nazi propaganda. We in America are facing an America I never believed I would see in my life. Today we live in a time where there are no absolutes. 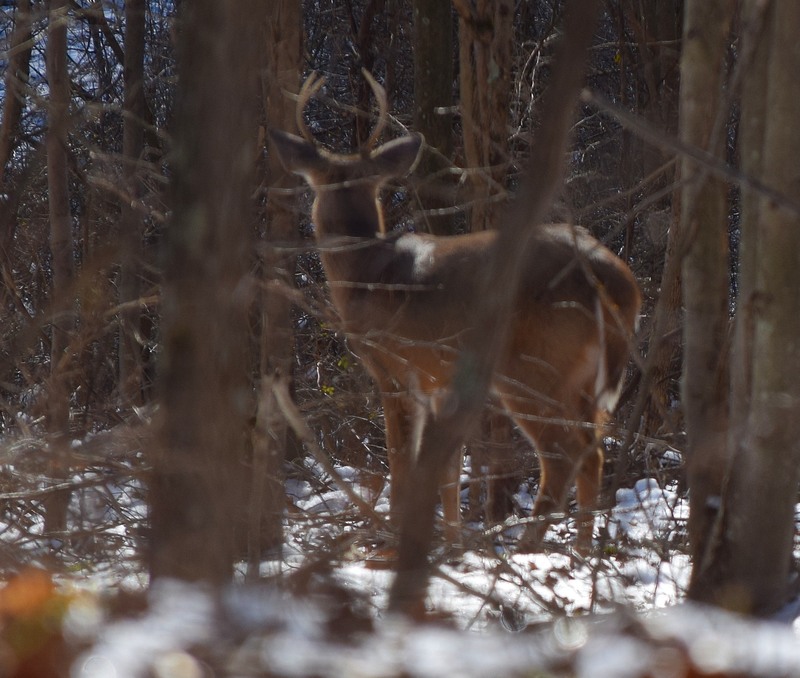 One of, at least, four illegal bucks I saw while hunting with my flintlock named, Old Jacob. I have been very neglectful of my journal entries. There has been much going on between my step-father’s accident and a pulled calf muscle on my right leg. I did get some flintlock hunting in, but failed to connect. 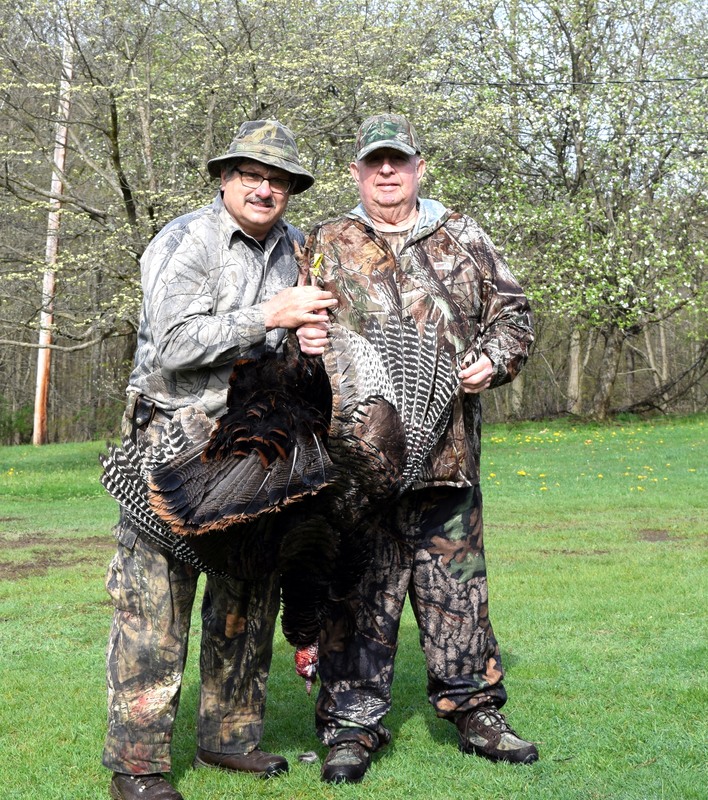 I never have had the blunders I had this past flintlock season. I “flubbed” ten shots. Most shots would have been down deer in the past, but for some reason, or reasons, I just didn’t fill a freezer. I came up with a thought late and that idea was to have prescription glasses made for distance and not these “progressive” lenses I currently have. maybe that will do the trick. eased up onto a feeding doe only to have a hang fire. The powder in the pan went off, but slower than normal. I actually witnessed the barrel move as the gun went off. One happy doe there my friends! I sense I may be having difficulty judging depth perceptions. I am getting older ya know. I had two unbelievable mishaps this season. I came down over a steep high-wall onto a sphagnum moss area. This is the moss used in making peat moss. It is usually spongy to walk on. Suddenly I was up to my belt in muck and old moss. Either I, instinctively, leaned forward or naturally fell that way. Regardless I was stuck for a few moments and, to be honest, somewhat scared for a brief time. Eventually, I freed my left leg followed by my right leg. I was soaked. My arms were soaked too from falling forward. Of course, I used my flinter to aid in getting out by throwing it ahead to use as support. Later, I had difficulty getting it to go off, but luckily managed to get enough dry powder moved around in the breech to shoot. My “possibles” bag was completely soaked including patching and such. Luckily my camera in my shoulder bag didn’t get soaked for the fabric was somewhat water resistant, plus I always keep a plastic bag at the bottom of the shoulder bag. 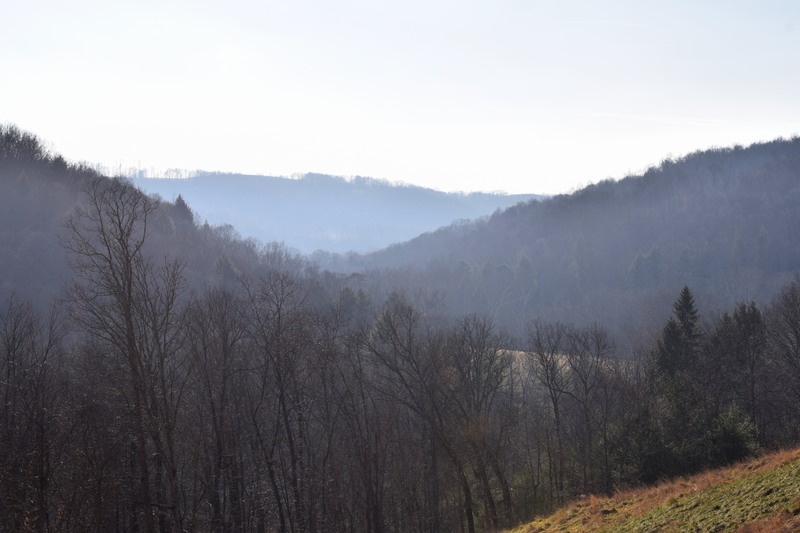 Another incident occurred while being above another old strip mine. 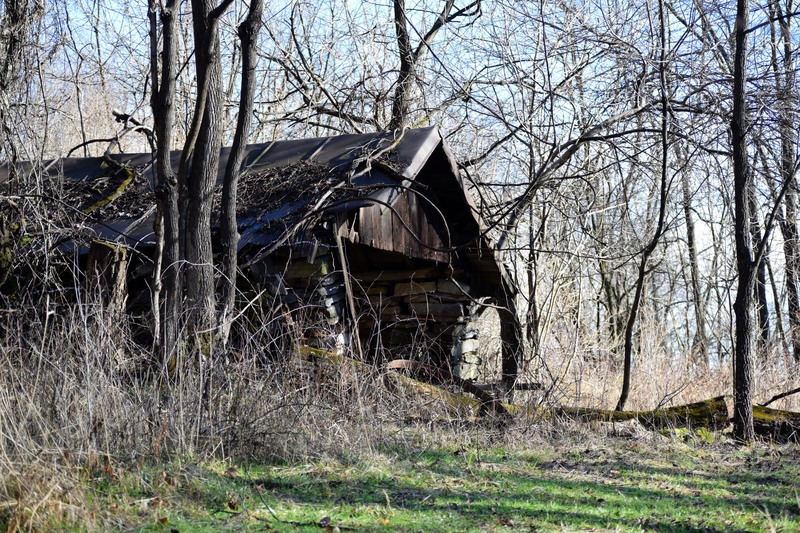 I was easing down at the mine’s edge to seek out a deer when my left leg suddenly went down into a fifteen to eighteen inch diameter hole. I quickly removed my leg only to see where an old coal mine had shifted allowing for a hole to form hidden under goldenrods and grasses. Lucky me for I didn’t break anything. Now let’s get back to the title of this journal entry… Bald Eagles. A friend, Bob “Slim” Bowser contacted me about walking. I told him I was free on Tuesday (January 15, 2019. 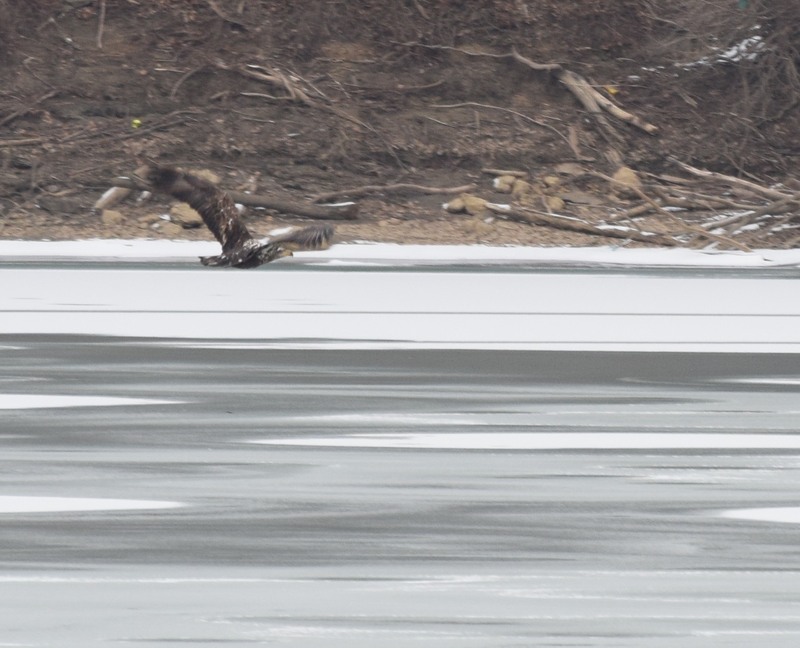 )and we planned a walk to Crooked Creek to see if any Bald eagles could be viewed. We lucked out. 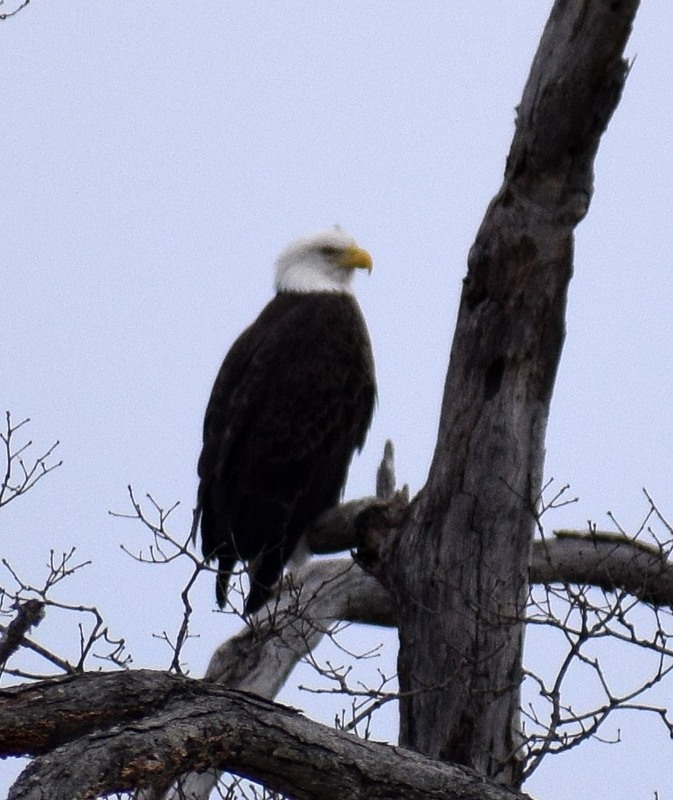 We saw two mature Bald eagles and, at least, three immature ones on this dark and gloomy morning hike. 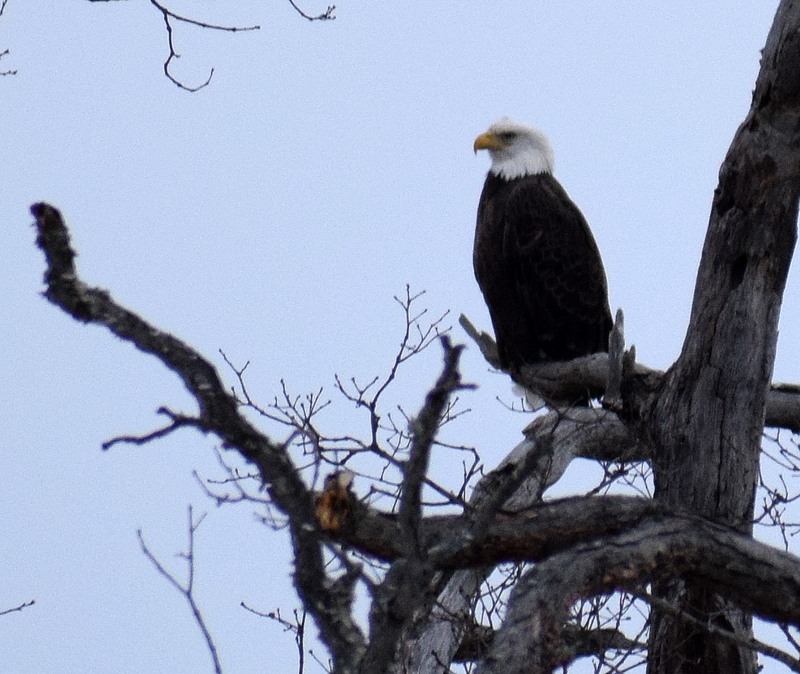 We even managed to get some photos of a pair of eagles settled onto an old snag. I met up with another photographer friend named, Craig Remaley. he takes great photos! 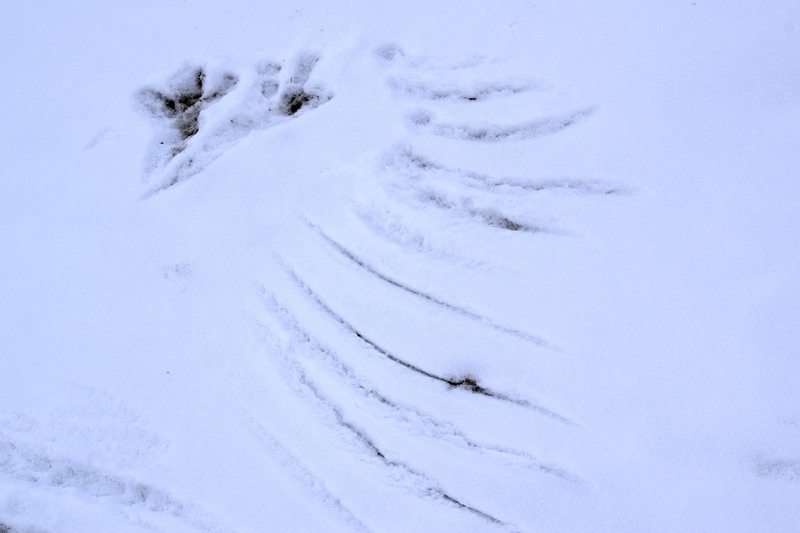 Eagle track and wing marks in the snow.